Last but not least, it’s important to notice that the sky chart on the night of December 25th is not a single occasion occurring only on Christmas night. The same sky chart can be watched every night throughout the last months of the year when the Silver Gate eventually shifts through the 90 degrees azimuth (perfectly East) at night. The point is that when this happens, the Pleiades will reside exactly where they should be, and that’s over the Seven Hills. So contrary to what Herschel claims, it’s not a rare astronomical event that only occurs at Christmas night in Rome! Intuitively however, Herschel couldn’t have picked a better date than the 25th of December. For indeed does the Eastern sky at the Vatican on this day represent the birth of Christ, better still the birth of the Sun in the precession cycle. As Wayne correctly explains on his website, the Three Kings of the Christmas tale astrologically represent the three belt stars of Orion. In South Africa, the three belt stars are actually called the ‘Drie Konings’ (Three Kings) and in Dutch 17th and 18th Century star charts the belt stars were named ‘Drie Koningen’. The three wise men coming from the East (the three belt stars of Orion) rise on the Eastern horizon in Rome on the night of December 25th. They must follow the star of Bethlehem since the star of Bethlehem is Betelgeuse which is part of the constellation Orion. 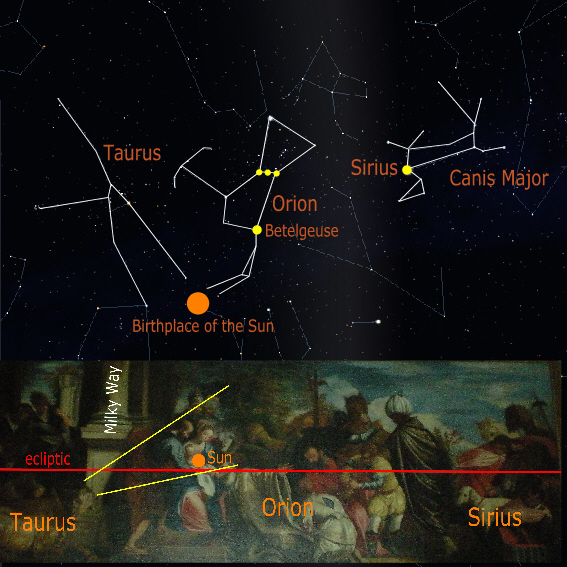 So, the three belt stars (the Three Kings) have no other choice but to follow Betelgeuse to the birthplace of Christ. At the Vatican, they move to the Silver Gate (birthplace). The shepherd dog of the shepherds in the field is Canis Major, the Dog Star while the ox in the Christmas stable is of course Taurus and they all play their part in the astronomical Christmas tale. The astronomical Christmas tale is the esoteric version of the true story of the birth of Christ as the Sun in the precession cycle. It has been painted and is silently hanging from the wall in the Eglise Saint Maurice in Annecy France. The place where Christ is born in the painting of Eglise Saint Maurice in Annecy, France above is exactly the birthplace (Silver Gate) of the Sun in the precession cycle at the Summer Solstice around 2012, the crossing place of the Milky Way and ecliptic. This ‘Christian’ event has been labeled the ‘Second Coming’ of Christ. The esoteric meaning of the Second Coming, however, is that the Sun of God and not the Son of God will be reborn at the ‘End of Time’.